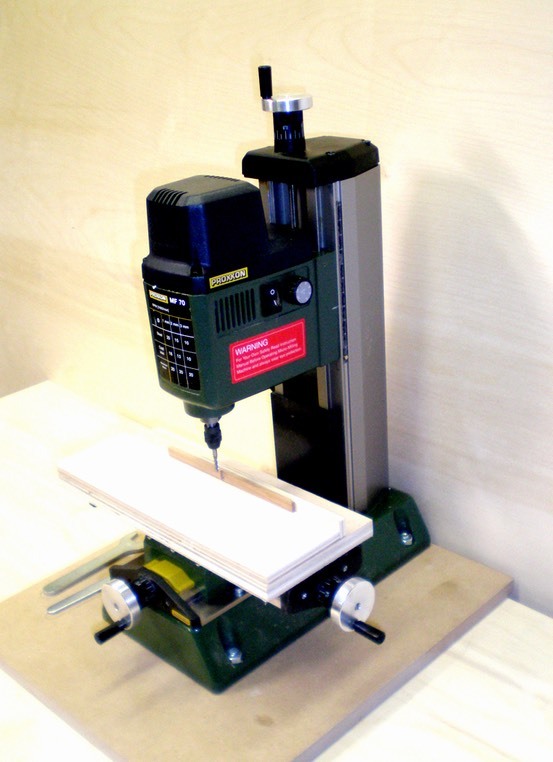 This vertical mill with an x-y table is suitable for use as an overhead shaper in miniature work. It has the accuracy and rigidity for exceptional results. Plenty of power and variable speed controls burning. Includes six precision steel collets for cutter shank sizes ranging from 1/32” to 1/8”. Two year warranty. The KT70 is identical to the cross feed table used on the MF 70 Mill. It can also be used on the Cameron, Proxxon and Microlux drill presses. An auxiliary shaping table with a fence is very useful for shaping wood. The aluminum table has adjustable dovetail slides and three T-slots for positioning. Both hand wheels have zero resettable dials with 1 mm travel per revolution and .05 mm graduations. •Table size - 7-7/8" x 2-3/4" (200 x 70 mm). •X travel - 5-7/32" (134 mm). •Y travel - 1-13/16" (46 mm), •overall height 1-11/16" (43 mm). WARNING: This product, when used for soldering, welding or cutting, produces fumes or gases, which contain chemicals, including lead, known to the State of California to cause cancer and birth defects or other reproductive harm. For more information go to www.P65Warnings.ca.gov.